Tumours, particularly mammary tumours or fatty lumps tend to be the most common old age associated condition in does. These are typically not a death sentence as they can often be removed if a rat is fit and well, however in some cases this is not possible so dietary support is valuable. Speaking to your vet about the chances of successful tumour removal is advisable (though be aware many vets can be reluctant to operate on small animals even if chances of success are high), it may also be worth discussing spaying if the rat is physically fit and well and is suffering from a mammary tumour as this can significantly lower the changes of it reoccurring. Tumours are typically caused by ageing cells suffering damage, this can cause them to begin reproducing rapidly and so a lump develops. 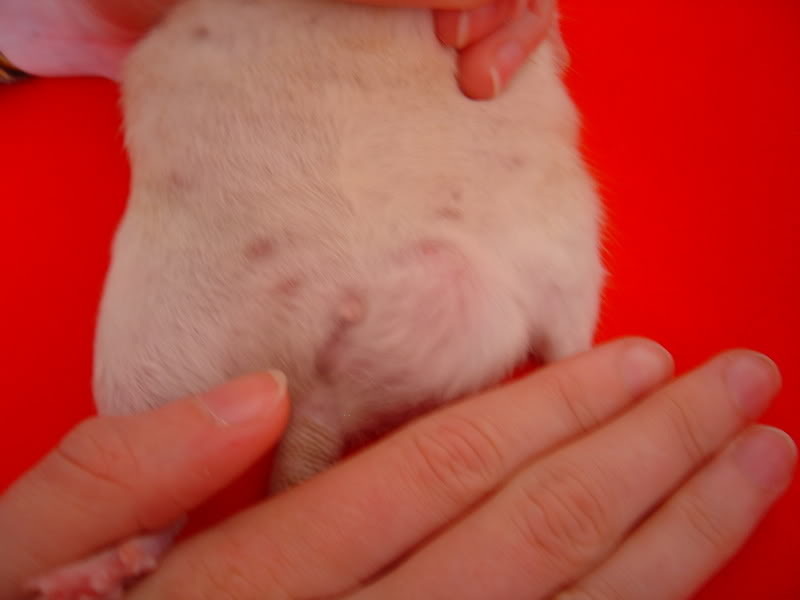 Typical places for these are armpits, along the sides, hind leg pits and around the tail base for mammary tumours, fatty lumps can occur anywhere along the skin though often occur along the side and armpit area too. A mammary lump (MT) is normally rounded and smooth, it generally feels as though it sits between the skin and muscle (these are the easiest to remove) sometimes they are more anchored and/or oval shaped, however typically they are smooth feeling and rounded feeling firm, a little like a slightly soft balloon. It starts out feeling like a small pea and can grow relatively fast or take months to come up, often seeming to change growth speed on a whim. A fatty lump (FL) is often more irregularly shaped and thinner. It tends to feel very soft and can be more irregular consistency, feeling slightly lumpy and uneven. These are generally first spotted as a thick patch of skin and feel loose sitting between the skin and muscle layers. Typically they grow at a moderate rate but can grow surprisingly rapidly in some cases. A testicular tumour (usually benign) is where a testicle gradually grows bigger than its partner, it can also discolour slightly. This normally happens slowly and causes no pain when palpitated. It can be mistaken for torsion (a twist injury which is very painful to the rat) or an infection (will generally swell faster and feel warmer than normal). In both MT and FL cases there is a fair bit you can do with the diet to help prevent them occurring, but also where surgery is not an option you can use diet to help slow the growth somewhat. Where removal is not an option (or a very risky one) it is a case of monitoring the tumour growth and the rat’s quality of life. A rat can cope very well with none cancerous tumours (cancerous tumours will make them ill very fast) and typically it is a case of watching to see when they are struggling to move around, the tumour is taking too much sustenance from their food (the rat will begin to get very skinny and not get much from its meals) or the tumour ulcerates (a sore appears on the surface) before having the rat put to sleep or risking a removal operation. It is worth noting that whilst mammary lumps are far more common in does, buck can also get them as they do have some mammary tissue too, fatty lumps occur pretty evenly in both sexes. With testicular tumours these are generally unlikely to spread or be malignant, however it is well worth neutering the rat to be on the safe side. Your vet should examine the rat, feeling the lump and trying to establish if it is deeply rooted, well circumscribed (with a definite edge and not blurring into other parts of the body and what the lump itself feels like. They should then carry out a general health check on the rat. The vet should then discuss the possibility of removal. 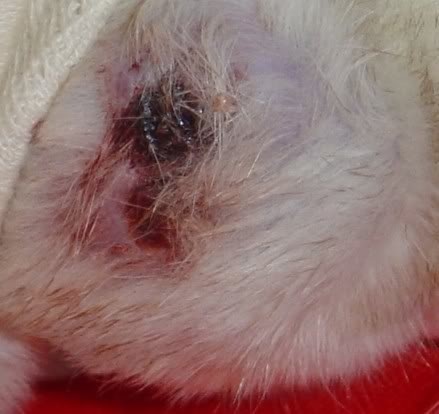 Most none cancerous lumps are straight forward to remove if the rat is in otherwise good health. Where a rat is fit and well with a straightforward mammary lump removal it is also well worth discussing the prospect of spaying at the same time (this reduces the chance of lumps reoccurring, and the growth rate if they do). If you can’t remove the tumour or make the decision not to due to the rats age, health or other factors, then there are a few options available to you. The first is to look at some of the hormonal suppressive drugs out there. The most commonly used in the UK is galastop (caberglobin) but there are others such as tamoxifen and bromo. These can slow the growth and even shrink the tumours in some cases. These can often work out more expensive than tumour removal and some rats do not tolerate taking medication well. You can also have a fair impact on tumour growth by feeding a suitable diet.